This new workbench from Robert W. Lang combines the best workholding devices and ideas from a number of historic bench forms, along with a few design twists of his own. Whether you use power tools or hand tools (or both), this knockdown bench design is perfectly suited for the modern workshop. • Enhanced PDF of magazine article, with step-by-step construction instruction. 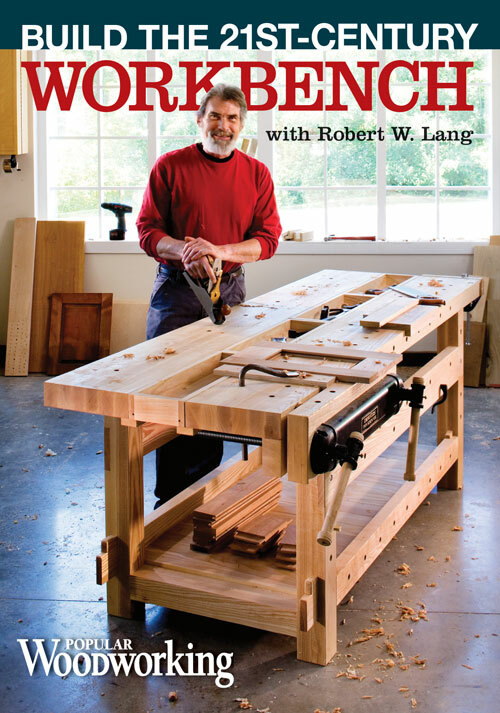 Bob Lang shows us how to build his 21st Century Workbench, a sturdy and practical design that should suit just about any woodworking style. The bench can be knocked down and employs wedged dovetail joints to hold everything together. Bob confidently guides us through his building process at a reasonable pace. Unfortunately, there are a few significant details left out of the demonstrations or a shortcut is taken by showing the finished product and simply stating what was done. However, this is counter-balanced by a nice package of DVD ROM extras including PDF plans, a SketchUp plan, and slideshows. A guest appearance by Chris Schwarz was nice and the subsequent vise discussion was a welcome surprise. But the time spent on this “extra” might have been better spent on elaborating on more project details. Given the total package though, just about anyone should be able to build this bench successfully with this DVD.